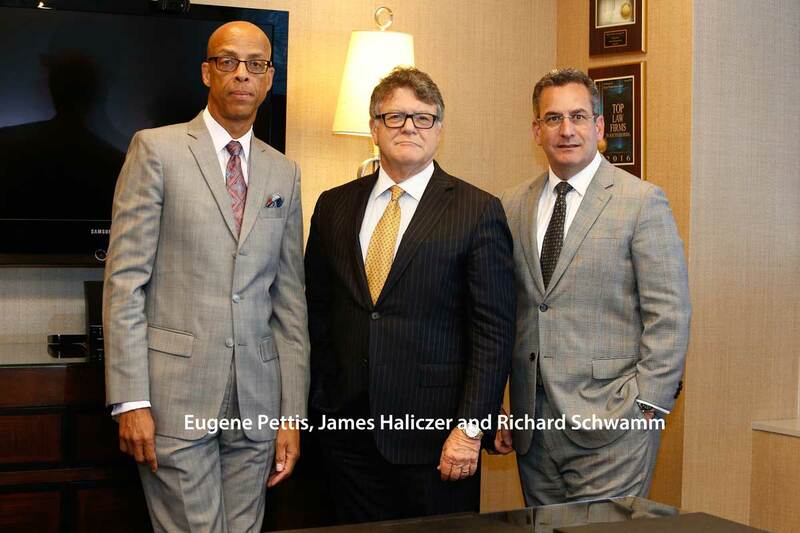 Founded by partners Haliczer, Eugene Pettis, and Richard Schwamm in 1996, the firm’s legal team has handled cases involving medical mistakes and other forms of negligence through the years, including a growing number of lawsuits by victims and their families. Most cases are handled on a contingency basis so there is no fee unless the firm recovers funds for its clients. “Given the tumultuous state of healthcare in America, we have collectively decided to switch sides to help those who need it most,” said Pettis, adding that the firm’s medical malpractice experience is an important consideration in personal injury cases as well. “If someone is injured in a car accident, or trips and has a serious fall while shopping, an attorney who knows about medicine can connect the dots in the case for a jury, potentially leading to a higher award or settlement,” he said. Haliczer has been involved in dozens of trials involving numerous medical and legal malpractice, personal injury, wrongful death, commercial and construction litigation. He was named 2015 Miami “Lawyer of the Year” in medical malpractice law by Best Lawyers in America®. A member of the American Board of Trial Advocacy, Haliczer has lectured throughout the country on malpractice, general insurance law and risk management/quality assurance programs. Pettis is a native of Fort Lauderdale, who has been practicing law since 1985. “My mom thought I should be a lawyer because I talked so much,” he said. After earning a bachelor’s degree in political science, he graduated from the University of Florida’s Levin College of Law in 1985. Pettis was recognized as a Distinguished Attorney by the South Florida Legal Guide in its 2011 edition. Two years later, he became the first African-American to serve as president of The Florida Bar, demonstrating his leadership abilities and his passion for giving back to his profession and his community. A member of the American Board of Trial Advocates, Pettis was recognized in 2013 as The Trial Lawyer of the Year by the board’s Fort Lauderdale chapter. He was named 2017 “Lawyer of the Year” by The Best Lawyers in America® for his work in plaintiff medical malpractice. A native of New York who was raised in South Florida, Schwamm knew he wanted to be an attorney at an early age. He overcame a long-time stutter and lisp and then excelled in high school mock trial competitions before earning his law degree from Stetson University in 1991. Today, Schwamm is a nationally recognized litigator and speaker in the area of medical malpractice litigation, including significant injury cases affecting families. “I am a vigorous advocate for children’s safety and fight for the legal rights of injured children and their families,” added Schwamm, who was selected for The Best Lawyers in America® 2018 edition for his work in plaintiff medical malpractice. If you or a loved one has been a victim of someone else’s negligence, it’s important to engage an experienced legal team as quickly as possible, according to Haliczer. The firm’s investigators, nurses and medical experts can start gathering the facts to find out what went wrong and who is responsible. Because the firm’s attorneys have a wealth of experience in these cases, Haliczer, Pettis and Schwamm know top-tier medical experts in a wide range of disciplines who can evaluate their client’s conditions. “We also have nurses who work in house for us who review medical records,” said Schwamm. “We also know forensic experts who can determine if a patient’s record has been changed after the fact. For instance, a doctor might not inform you about treatment alternatives or the potential risks of a surgical procedure. The wrong medication might be prescribed or there might be serious side effects from a medical device. Other errors can occur during the rehabilitation or recovery process, such as missing the warning signs of another medical problem. To reduce the risk of malpractice, Richard Schwamm says patients should try to learn as much as possible about an injury, disease or chronic condition. Then ask as many questions as possible. If you aren’t sure about provider’s recommendations, you can request a second opinion from another doctor.